Can you imagine getting drunk with Jim Thompson, O Henry and Roald Dahl? Can you imagine the rush, the laughs and the chills? Well, yes or no, sit yourself down, hell, lie down if you want to, and knock back a couple of shots of the dark stuff, the strong stuff, courtesy of Mr Dave Zeltserman. 21 Tales is a classy pulp collection which reads like a beaut of an anthology , although all twenty one stories were written by one man. 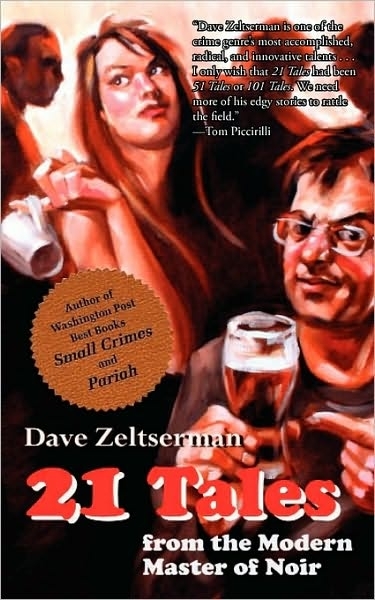 If you’re familiar with Dave Zeltserman brilliant crime novels- like Killer or Small Crimes- or his horror novels- like Blood Crimes– you’ll know that Zeltserman is a master noir story teller. With 21 Tales he gives us a veritable cornucopia of stories that were written between 1992 and 2006. There is crime, suspense, sci-fi, horror and myriad cross pollinations of those genres. 21 Tales is a lethal –Molotov – cocktail that won’t give you a hangover but could give nightmares. Bio: Spinetingler Award nominee Paul D. Brazill – AKA The Big Bamboozler -was born in Hartlepool, England and lives in Bydgoszcz, Poland. He started writing short stories at the end of 2008 and his writing has appeared in all sorts of print and electronic magazines and anthologies, such as Beat To A Pulp, Crimefactory, Dark Valentine, Needle – A Magazine Of Noir, Radgepacket and the 2011 Mammoth Book Of Best British Crime. His blog is YOU WOULD SAY THAT WOULDN’T YOU? Zeltserman is one of the best. Been meaning to pick up this collection and I think you’ve inspired, Mr. Brazill. It’s a good un, Chris.